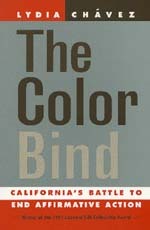 The Color Bind tells the story of how Glynn Custred and Thomas Wood, two unknown academics, decided to write Proposition 209 in 1992 and thereby set in motion a series of events, far beyond their control, destined to transform the legal, political, and everyday meaning of civil rights for the next generation. Going behind the mass media coverage of the initiative, Lydia Chávez narrates the complex underlying motivations and maneuvering of the people, organizations, and political parties involved in the campaign to end affirmative action in California. For the first time, the role of University of California regent Ward Connerly in the campaign—one largely assigned to public relations—is put into perspective. In the course of the book Chávez also provides a rare behind-the-scenes journalistic account of the complex and fascinating workings of the initiative process. Chávez recreates the post-election climate of 1994, when the California Civil Rights Initiative (CCRI) appeared to be the right-time, right-place vehicle for Governor Pete Wilson and other Republican presidential prospects. President Clinton and the state Democratic Party thought the CCRI would splinter the party and jeopardize the upcoming presidential election. The Republicans, who saw the CCRI as a "wedge issue" to use against the Democrats, found to their surprise that the initiative was much more divisive in their own party. Updating her text to include the most current material, Chávez deftly delineates the interplay of competing interests around the CCRI, and explains why the opposition was unsuccessful in its strategy to fight the initiative. Her analysis probes the momentous—and national—implications of this state initiative in shaping the future of affirmative action in this country. Lydia Chávez is Associate Professor at the School of Journalism at the University of California, Berkeley.